Odds are much better that you definitely miss the Red Barn. The longtime, much-loved restaurant on Wilton Road near Merritt Parkway Exit 41 closed 3 1/2 years ago. The Westport Weston Family Y now owns it. They have yet to decide what to do with the valuable building and property. This entry was posted in Friday Flashback, Restaurants and tagged Red Barn Restaurant. Bookmark the permalink. …and that’s really a shame. Oh…. so this is our “non-profit”, regional YMCA, who pays NO taxes to the town of Westport. Gee… I wonder what they will do with this????? this is not unique to Westport Ct. These rules apply throughout the USA. Thanks for letting us know you are a dentist. Has the Y made public what the options are? That is such an iconic building for generations of Westporters. It would be great if they could somehow preserve the exterior (regardless of what they ultimately choose to do inside). Of course, we still miss seeing the Nisticos inside that building. 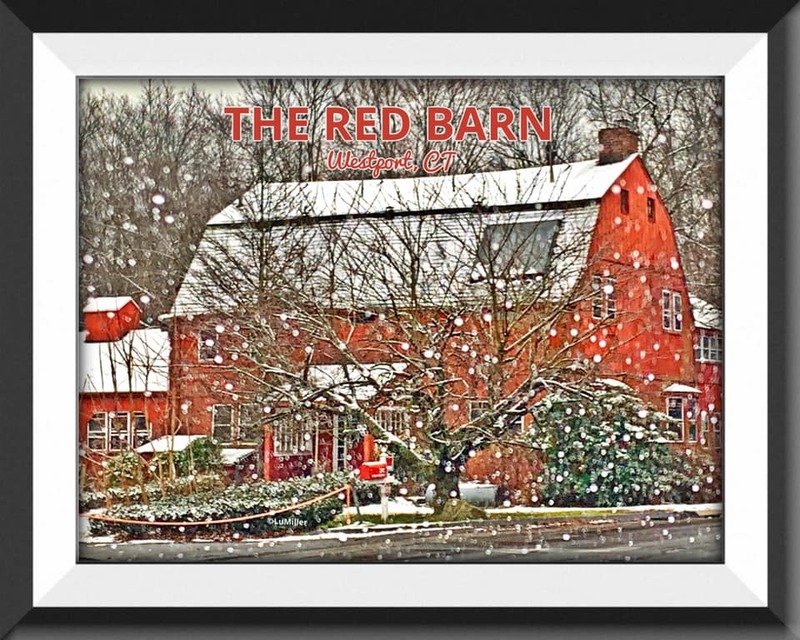 The Red Barn was always my favorite place. My dad was their electrician for many years so we went there quite a bit. I even had my rehearsal dinner there when I got married in 2000. Even after I moved upstate, I still tried to come down for brunch every once in a while. About 15 years ago, I was at a flea market in Clinton and a guy was selling vintage postcards. I found one of the Red Barn and framed it. It hangs in my living room with other Westport paraphernalia I have collected over the years. One of my first jobs in high school; coat check, cashier and then waitress. An interesting cast of characters in the late 70’s–oh the tales I could tell beneath that charming exterior! The Red Barn was witness to the passage of many major events in the lives of Westporters. Have been there for showers, office parties, weddings, birthdays,graduations, too many funerals, several class renunions and just plain for dinner. It is more than just an empty building, and I miss it. The last time I was at the Red Barn was for a Staples Class Reunion lunch in October 2010. The company and the meal were memorable. In earlier days what were the upper floors used for? Was it also an inn? Thank You Lynn, Dan for posting and everyone for sharing their memories. Yes, it was a favorite place for many of us. I just even loved driving by it. The Spinning Wheel and Three Bears have gone…Hopefully the Y will repurpose the building. It is iconic and has a great history. Mary, I’m glad you liked this picture of such an iconic Westport landmark. I grew up about a mile from there and once we spied the Red Barn from the Merritt, we knew that we were just about home. And you may be happy to hear that I believe that the Spinning Wheel in Redding is still open. Thank you! Since the Spinning Wheel is in Redding I am sure that I really meant to mention a different restaurant. But at the moment my mind is blank. As a kid our second home in Westport was on Wilton Road. Not far from the Merritt exit. There was a pond on the left side of the road that we skated on as little kids. Great Memories. In 1948 we moved to the other side of the river. I have an earlier memory sometime in the 60’s of traveling on the Merritt seeing this building with a big sign on the roof peak and looking fairly derelict. Could this have been real or just a mind conjuring up stuff? I can’t speak to the ‘60s but my recollection is that it has looked fairly derelict at least since the mid ‘80s. However, I believe the correct Westport adjective is “rustic” rather than “derelict” which, of course, is what gives the building its charm.